Blade & Sword is a Chinese Diablo-style action RPG which is far worse than its inspiration and similar titles like the Incredible Adventures of Van Helsing and which remains little more than a curio that only diehard genre fans will get any fun out of. It's got an unusual setting and some intriguing combat moves but this isn't enough to save it from being largely tedious. The story takes place in 1044 BC, and starts out with the Emperor setting fire to himself when his land is invaded, and with his grand wizard then opening up a portal between the realms which allows all sorts of hideous monsters to break through and cause chaos. As the typical bold adventurer, it's your job to roam through the three realms, human, beast and demon, in order to defeat the emperor, the wizard and of course, all those nasty monsters. What follows is a typical isometric action RPG, but which focuses on kung-fu-style combat. You have a choice of three characters, each with their own unique attacks and which can be strung together to create devastating combos. Blade & Sword is tough game to recommend. It's got some good ideas, while the setting is certainly unusual enough to warrant inspection, but there are a number of issues which really hamper things. 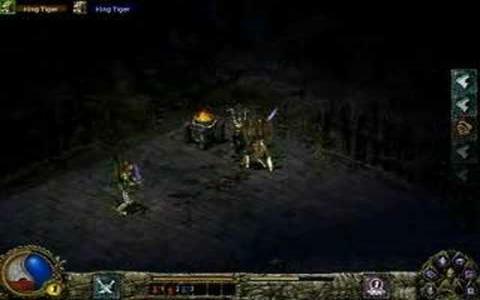 The gameplay is a straight copy of Diablo II, but with combat that gets very tedious, while there's also a very bizarre save game facility, and things are incredibly tough. Add in some rather ugly low res visuals and you're left with little more than a repetitive actioner with little to recommend it.